Personnel – Patrick Zimmerli: tenor saxophone; Ethan Iverson: bass; Chris Tordini: bass; John Hollenbeck: drums. Saxophonist Patrick Zimmerli penned an hour-length suite of new music to be played by the members of his quartet: former Bad Plus pianist Ethan Iverson, vigorous bassist Chris Tordini, and spectacular drummer John Hollenbeck. 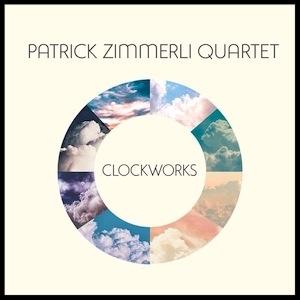 The album, Clockworks, is a breathtaking foray into metrics, temporal expressions and variations, cadenced movements, percolating polyrhythms, and mind-boggling patterns that make Zimmerli’s music highly contemporary, memorable, and unique. “A Scattering of Stars” opens and closes out the album with two different readings. The nearly 5-minute ‘Theme’ version concludes the session as a rubato lament with timbral explorations and noticeable percussive reinforcement, whereas the opening 'Distention Variation', lasting 41 seconds, prepares our ears to receive the inventive “Pendulum”. This latter composition brings out unison melodies that swim against a crawling rhythmic counter-current with superimposed patterns of 5 and 4. Iversen’s ostinato, centered on a precise idea and bolstered by epic reverberating notes on the lower register, develops into a lyric solo moment and then into an open, iconoclastic improvisation with Tordini’s crisp groove supporting it. It’s an odd dance whose kinetic energy guides us to a grandiose finale. A bass soliloquy introduces “Metric Variation” before an uptempo swinging romp occurs. Iversen, teaming up with his rhythm section mates, melodically drives it in a classic piano-bass-drums trio setting. There are two other variations, in which Iversen occupies a central spot: “Linear Variation” sounds like a modern classical fugue regulated for swift speed, while “Harmonic Variation” is mostly solo piano, except for the last 30 seconds, where the surefooted coalition of bass and drums tags along. In addition to the virtues of the dynamics, Zimmerli explores timbres on “The Center of the Clock”, a static piece whose crepuscular tranquility is undisturbed by the nuanced piano harmonization and percussive details in the background. You’ll experience pure peace of mind. Both stylishly temporized with agile motions, “Waltz of the Polyrhythmic Palindrome” and “Boogaloo of the Polyrhythmic Palindrome” are completely distinct compositions that use simple polyrhythms and their reciprocals. The former is a delightful, intimate affair with two separate sections, one searching and other more traditional and rushing for resolution, while 'Boogaloo' boasts an Afro-Latin rhythm, conveniently spiked up by sultry saxophone lines, convulsive bass groove, piano statements that are as much liberating as uncomplicated, and Hollenbeck’s intelligent thumps, which precede the theme’s reinstatement. “Windup”, one of my favorites, navigates a shifting terrain of emotional and rhythmic bravado, presenting edgy yet never-dissonant speeches. The bandleader limns stirring melodic patterns that, blending classical and jazz elements, made me think of an incorruptible integration of medieval dances and modern currents. This quartet of modernists allows us to discover new ways of looking at jazz through oblique angles and groundbreaking perspectives. The inviolable authenticity of the group is remarkable, and Clockworks is a preciousness that simply shines with a levitational synergy.